Mum’s House, Dad’s House at Exam Time: A survival guide. It can be challenging enough for a teenager to negotiate two households after their parents’ separation, let alone juggle this on top of exams! Most students find exam time a stressful period, so your teenager doesn’t need additional stressors. How can you make things better for your adolescent doing exams? If it’s a recent separation, by all means write a note to the school or have a word with the Year Advisor, telling them about the family circumstances and the impact on your teenager. If your child is sitting for external exams, special consideration forms will be available, as a safety net if needed. If the separation is long-standing, an important consideration is that time sharing arrangements are for the benefit of your child and must be suitable for the child’s age and stage of development. Schedules made when the child is younger may need to be reviewed when the child starts high school or transitions into more advanced grades. This applies especially when there has been shared care. Family Court orders are static, but family needs are bound to change as children get older, their peer group becomes more important to them and extracurricular activities and study demand the young person’s attention. If changing the schedule proves difficult, there are specialised services, such as the Resilience Centre’s Family Clinic to help you. What are some of the considerations you need to consider for your student at exam time? 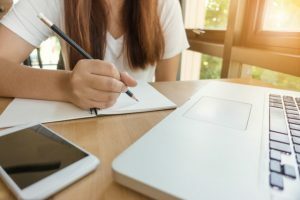 Creating a study space: It’s probably a good idea for teenagers to have the stability of living in one household during the exams, certainly during the school week. The choice might come down to which is the primary residence, or if there is fifty-fifty shared care, which is the quieter, less busy household? It may be that the quieter household is not the primary residence, and the teenager may be able to study for the exams better at the spends-time-with parent’s house rather than the lives-with parent’s home. Make getting to school easy: Proximity to the school is another important consideration. Time spent travelling is time that could be put to better use studying, or exercising to promote the young person’s alertness. While travel time can be used for study to some extent, it’s better to minimise it, so that your student can prepare for exams at home or in an environment with fewer distractions. You are what you eat: Good nutrition is essential, especially during times of stress. You can support your teenager’s brain function with balanced and nutritious meals. Some foods that contain Vitamin B1, such as brown rice, sunflower seeds, tuna, pork and beef can help with poor concentration and attention. Junk foods will make your teenager sluggish and his or her brain foggy. So another consideration of where you student should be based during exams is which household is better positioned at that time to prepare nourishing meals. Flexibility: What if your teenager lives primarily with you and spends every second weekend with the other parent? Would the other parent consider suspending or modifying the weekend stays until the exams are out of the way? This might also apply in the couple of week’s lead-up to the exams, especially if the exams are major ones, like the HSC. This is a case where a family conference might be called for. Including the adolescent can be a really helpful way of coming up with a solution that works for the whole family. Sometimes, making changes and trying different things can be challenging and confronting for many of parents. It’s usually good to remember that these changes are temporary arrangements based on what is most helpful for your child, and not setting a new precedent for how things will look in the future. Nevertheless, its times like these where you might consider getting help from a third party such as a Family Group Conference Facilitator to help you get through it all. Pieces and puzzles: The thing about puzzles is that you can’t complete them without all of the pieces, so use all the pieces! The young person is a key piece in a separated family and should most certainly have a say in the arrangements. Parents need to respectfully listen to their child’s request for time, or to modify the schedule, and ensure that the teenager does not witness any conflict between the parents, especially on the teenager’s account. De-stress, it’s not your test: Exams and assignments can sometimes be more stressful for parents than for young people. Parents can sometimes spend so much of their own energy looking in and worrying that any attempt to help might be taken the wrong way. For parents, keeping calm on the outside usually means working hard on the inside. As a parent of a studying teen, make sure you still find time to do the things that make you ok: a short mindfulness exercise, a workout at the gym, a chat with a friend or a good glass of red. Just one! With a little bit of planning and tuning-in to your teenager, both student and parents can look forward to coming through with flying colours!